#4800, the first of the 139 GG-1's built by the Pennsylvania Railroad featured an rather awkward, riveted carbody. Not satisfied, the railroad brought in the famed industrial designer Raymond Loewy, who fashioned a much smoother, welded carbody which was employed for the balance of the fleet. The unique 4800 acquired the nickname "Old Rivets" in honor of her appearance. 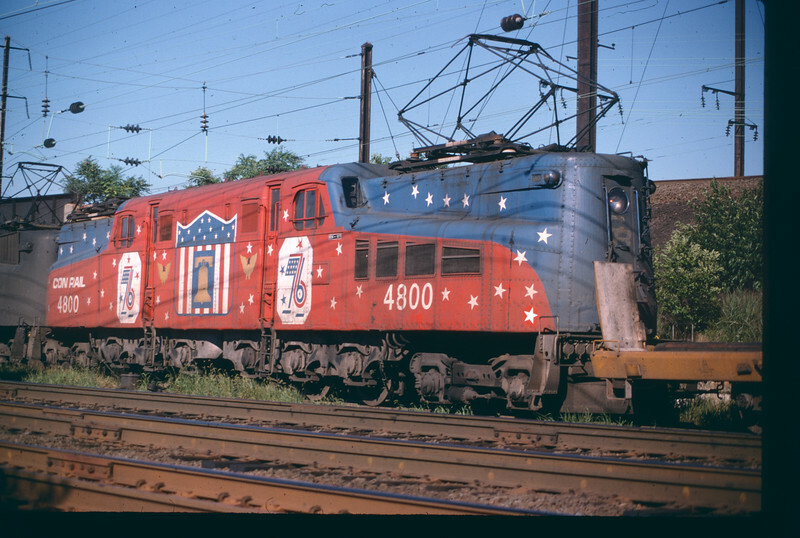 In her last years she was bumped down to freight service and acquired a rather gaudy paint scheme in honor of the nation's bicentennial in 1976. Here she is seen entering the south end of Waverly Yard in Newark, NJ.